Instantly get the reports & presentations you need. 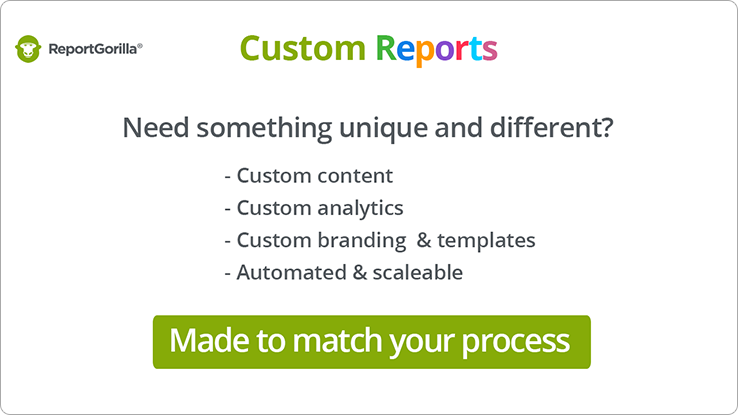 Plus: custom reports, custom analytics & templates. 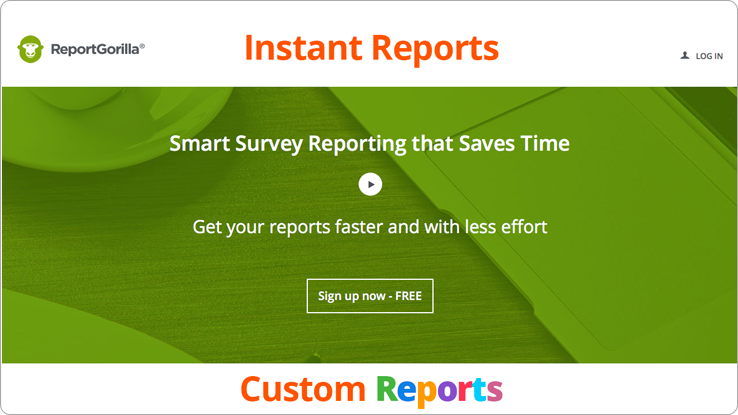 You're looking for a faster or different way to report your survey data? You want something you can't easily do with the available built-in tools? Effortlessly create reports and presentations that help tell the stories hidden in your data - so you can focus on making better decisions. We show you reporting options based on the structure of your survey. Find the ones that work for you, click and you're done. => How does it work? "I didn't know I wanted it until I saw it." 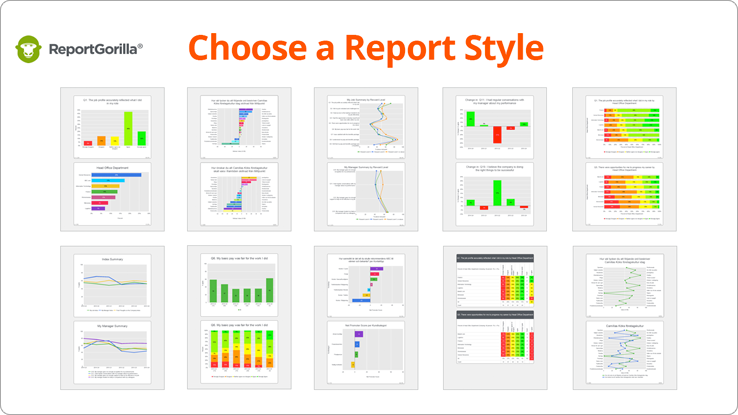 We have loads of reporting options you can browse in the => Report Gallery. Test them FREE with your survey. Find what's right for your audience. 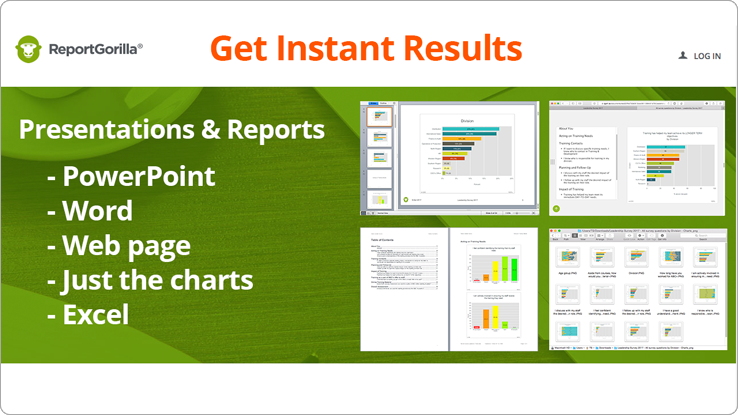 Get your results in Powerpoint, Word, Web pages, Excel or just charts and table images for use anywhere. No more mind-numbing manipulation of data, frustating formatting and endless, error-prone processing. Get results effortlessly so you can focus on insights, decisions and action. Apply advanced analytics automatically. Need something not available out of the box? We'll set that up for you too. Custom content, custom analytics, branding and templates, automated and scaleable for convenience. Data driven, individually constructed reports. This research project is about creating individual assessments at scale, using logic modelled on what expert consultants do using answers from individual patients, customers, trainees or employees. Nothing to install, no plans and no subscriptions. Preview any report FREE using realistic test data based on your survey. Pay only for the reports with real data that you actually need.